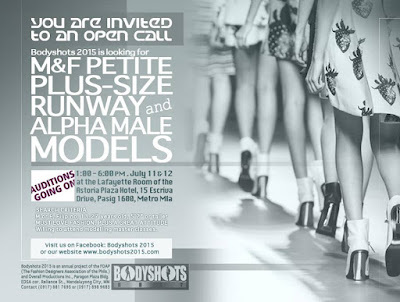 The Fashion Designers Association of the Philippines has conducted the Bodyshots Model Search for 3 decades now. Today, it is more relevant than ever, as it searches for the country's most promising new modelling talent in Petite, Plus-Size, Runway, and Alpha Male categories. The FDAP believes in promoting the beauty of Filipino and Asian models who are generally smaller and fairer-skinned than Western skinny white models. Today's designers are reaching out to admirers of fashion design more than ever, with this year's Pan-Asian-themed model search and fashion design competition. Auditions will be held on July 11-12, 2015 at Lafayette Room, Astoria Plaza Hotel, 15 Escriva Drive, Pasig City. Join Bodyshots 2015 now!